OrbsCorbs: Happy St. John's Day! While growing up, every June 24th my mother would wish me a "Happy Namesday." She told me this holiday was a big deal in Latvia (and most of northern Europe, as it turns out). "Midsummer, also known as St John's Day, is the period of time centred upon the summer solstice, and more specifically the Northern European celebrations that accompany the actual solstice or take place on a day between June 19 and June 25 and the preceding evening. The exact dates vary between different cultures. The Christian Church designated June 24 as the feast day of the early Christian martyr St John the Baptist, and the observance of St John's Day begins the evening before, known as St John's Eve. "These are commemorated by many Christian denominations. 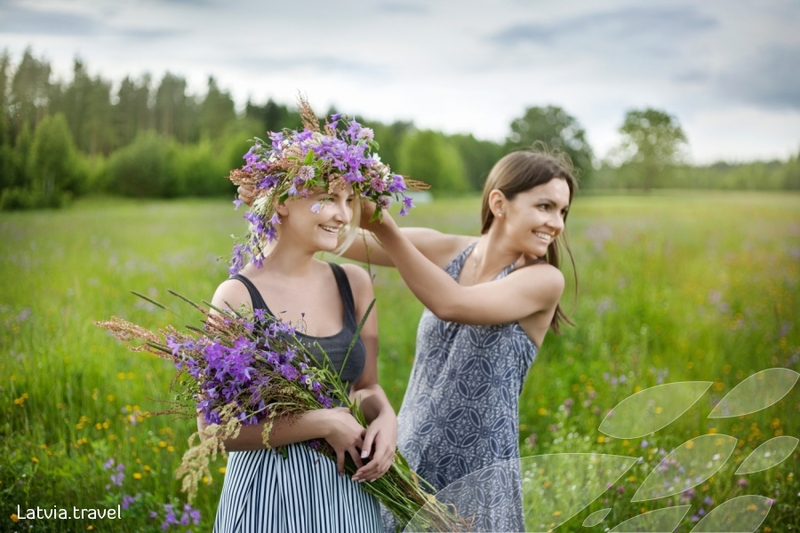 In Sweden the Midsummer is such an important festivity that there have been serious discussions to make the Midsummer's Eve into the National Day of Sweden, instead of June 6. It may also be referred to as St. Hans Day. "In Latvia, Midsummer is called Jāņi (plural of Latvian name Jānis, which is equivalent to John) or Līgo svētki (svētki = festival). It is a national holiday celebrated from the night of June 23 through June 24 on a large scale by almost everyone in Latvia and by people of Latvian origin abroad. Celebrations consist of a lot of traditional and mostly pagan elements – eating, Jāņi cheese, drinking beer, baking pīrāgi, singing Latvian folk songs dedicated to Jāņi, burning bonfires to keep light all through the night and jumping over it, wearing wreaths of flowers (for women) and oak leaves (for men) together with modern commercial products and ideas. 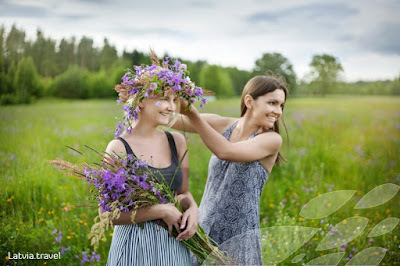 There are tens and hundreds of different beliefs and traditions all over Latvia on what should be done on that day for good harvest, for predicting the future, for attracting your future spouse etc. People decorate their houses and lands with birch or sometimes oak branches and flowers as well as leaves, especially fern. In rural areas livestock is also decorated. In modern days small oak branches with leaves are attached to the cars in Latvia during the festivity. Jāņi has been a strong aspect of Latvian culture throughout history, originating in pre-Christian Latvia as an ancient fertility cult. "In the western town of Kuldīga, revellers mark the holiday by running naked through the town at three in the morning. The event has taken place since 2000. Runners are rewarded with beer, and police are on hand in case any 'puritans' attempt to interfere with the naked run." Us Latvians know how to have a good time.